Today, VMware has published the long-awaited patch for the ESXi 6.0 CBT bug. This patch is the result of a problem, which is described in KB2114076 (Backing up a virtual machine with Change Block Tracking (CBT) enabled fails after upgrading to or installing VMware ESXi 6.0). All customers that upgraded to ESXi 6.0 or installed ESXi 6.0 were affected. A workaround was to disable CBT, which resulted in longer running backups. You can download the patch (ESXi600-201505401-BG) from VMware to manually update your ESXi hosts. Otherwise you can use VMware Update Manager to patch your hosts. A reboot is necessary! If you decide to manually update your hosts with this patch, you have to use the “esxcli software vib” command to install the patch. esxcli software vib install -d "/vmfs/volumes/datastore1/patch-directory/ESXi600-201505001.zip"
If you have disabled CBT for all or some of your VMs, make sure that you re-enable CBT. This entry was posted in Virtualization and tagged backup, bug, esxi, Toda, vExpert, vsphere on May 14, 2015 by Patrick Terlisten. Some days ago a colleague and I implemented a small 3-node VMware vSphere Essentials Plus cluster with a HP 3PAR StoreServ 7200c. Costs are always a sore point in SMB environments, so it should not surprise that we used iSCSI in this design. I had some doubt about using iSCSI with a HP 3PAR StoreServ, mostly because of the performance and complexity. IMHO iSCSI is more complex to implement then Fibre Channel (FC). But in this case I had to deal with it. If you decide to use iSCSI with a HP 3PAR StoreServ, you have only one option: Adding a 2-port 10GbE iSCSI/ FCoE adapter to each node. There is no other iSCSI option. The available 2-port 10GbE ethernet adapter and 4-port 1GbE ethernet adapter can’t be used for iSCSI connectivity. These adapters can only be used with the HP 3PAR File Persona Software Suite. The 2-port 10GbE iSCSI/ FCoE adapter is a converged network adapter (CNA) and supports iSCSI or Fibre Channel over Ethernet (FCoE). The adapter can only be used for host connectivity and you have to select iSCSI or FCoE. You can’t use the CNA for remote copy. You have to add a CNA to each nodes in a node pair. You can have up to four 10 GbE ports in a 3PAR 7200 series, or up to eight 10 GbE ports in a 3PAR 7400 series. If you use any other switch vendor, I strongly recommend to use the included 10 GbE SR SFP+ transceivers and 10 GbE SR SFP+ transceivers on the switch-side. In this case you have to use fiber cable to connect the 3PAR to the network. In any other case I recommend to use DAC for network connectivity. The use of jumbo frames with iSCSI is a often discussed topic. It’s often argued that complexity and performance gain would be disproportionate. I’m a bit biased. I think that the use of jumbo frames is a must when using iSCSI. I always configure jumbo frames for vMotion, so the costs for configuring Jumbo frames is low for me in an iSCSI environment. Don’t forget to configure jumbo frames on all devices in the path: VMkernel ports, vSwitches, physical switches and 3PAR CNAs. Always use at least two physical switches for iSCSI connectivity. This concept is compareable to a Fibre Channel dual-fabric SAN. I like the concept of switch aggegration (the wording may vary between vendors). I often work with HP Networking and I like the HP 2920 or 5820 Switch Series. These switches can form stacks in which multiple physical switches act a as a single virtual device. These stacks provide redundancy and operational simplicity. In combination with two VLANs you can build a powerful, redundant and resilient iSCSI SAN. 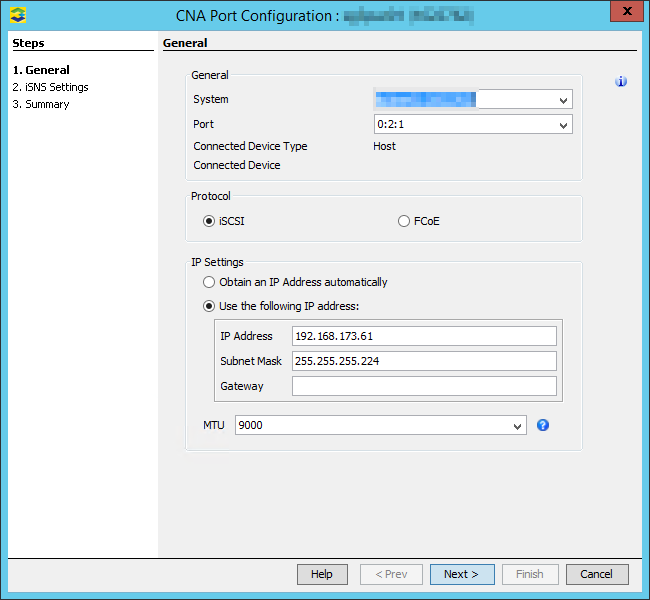 The CNA ports can only be used for host connectivity, therefore there is no way to use them for disk or remote copy connectivity. Before you can use the port for host connectivity, you have to select iSCSI or FCoE as storage protocol. 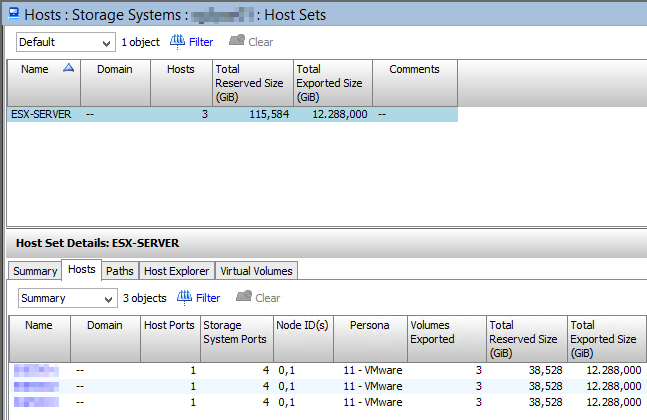 You can organize hosts and volumes in host sets and volume sets. I recommend to create a host set for all ESXi hosts in a vSphere cluster. I also recommend to create a volume set to group all volumes that should be presented to a host or host set. When exporting Virtual Volumes (VV), you can export a volume set to a host set. If you add a host to the host set, the host will see all volumes in the volume set. If you add a volume to a volume set, the hosts in the host set will all see the newly added volume. This simplifies host and volume management and it reduced the possibilty of human errors. 3PAR OS 3.1.2 introduced the new Host Persona 11 for VMware which enables asymmetric logical unit access (ALUA). Beside Host Persona 11, Host Persona 6 for VMware is also available, but it doesn’t support ALUA. 3PAR OS 3.1.3 is the last release that included support Host Persona 6 AND 11 for VMware. All later releases only include Host Persona 11. I strongly recommend to use Host Persona 11 for VMware. You should also add a custom SATP rule. This rule can be added by using ESXCLI. # esxcli storage nmp satp rule add -s "VMW_SATP_ALUA" -P "VMW_PSP_RR" -O iops=1 -c "tpgs_on" -V "3PARdata" -M "VV" -e "HP 3PAR Custom iSCSI/FC/FCoE ALUA Rule"
This custom rule sets VMW_PSP_RR as the default PSP and it evenly distribute the IOs over all active paths by switching to the next active path after each IO. Before you can use an exported volume, the host needs to discover the volume from the target. You have to configure the iSCSI discovery in the settings of the software iSCSI initiator. Typically you will use the dynamic discovery process. In this case, the initiator uses SendTargets request to get a list of available targets. After adding the IP addresses of the 3PAR CNAs to the dynamic discovery list, the static discovery list is filled automatically. In case of multiple subnets, the dynamic discovery process can carry some caveats. Chris Wahl has highlighted this problem in his blog post “Exercise Caution Using Dynamic Discovery for Multi-Homed iSCSI Targets“. My colleague Claudia and I stumbled over this behaviour in our last 3PAR project. Removing the IP addresses from the dynamic discovery will result in the loss of the static discovery entries. After a reboot, the entries in the static discovery list will be gone and therefore no volumes will be discovered. I added a comment to Chris blog post and he was able to confirm this behaviour. The solution is to use the dynamic discovery to get a list of targets, and then add the targets manually to the static discovery list. HP 3PAR and iSCSI is a equivalent solution to HP 3PAR and Fibre Channel/ FCoE. Especially in SMB environments, iSCSI is a good choice to bring to the customer 3PAR goodness to a reasonable price. This entry was posted in Storage and tagged 3par, esxi, hp, storage, vExpert, vmware, vsphere on March 16, 2015 by Patrick Terlisten. While preparing for a VMware vSphere 5.5 update at a customer of mine, I stumbled over VMware KB2085618 (ESXi host cannot initiate vMotion or enable services and reports the error: Heap globalCartel-1 already at its maximum size.Cannot expand.). I checked the HP AMS version in the latest HP custom ESXi image and found out, that version hp-ams-esx-550.10.0.0-18.1198610 is included (source). Unfortunately the bug is not fixed in 10.0.0, but it’s fixed in 10.0.1 (source). 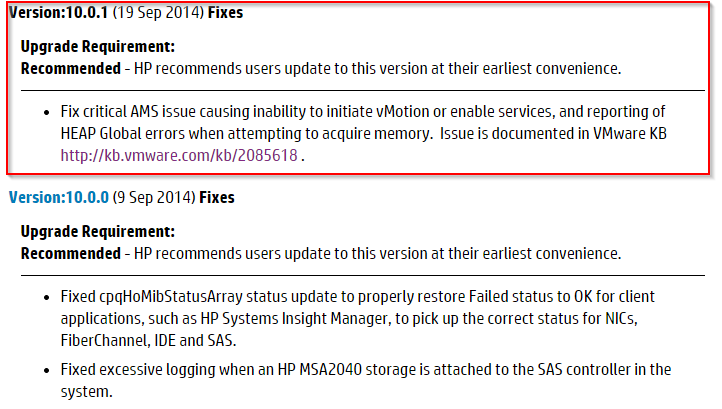 According to the VMware KB article only the HP AMS versions hp-ams 500.9.6.0-12.434156 and hp-ams-550.9.6.0-12.1198610 should be affected. But since I do not like surprises, I decided to update the HP AMS version in the latest HP custom ESXi image from 10.0.0 to 10.0.1. Before you can start building a new customized ESXi image, you have to fulfill some prerequisites. Copy both downloaded files into a temporary folder. Then import both depot files. You can proof the success with Get-EsxImageProfile which should show you the just imported ESXi image file version. The next step is to clone the image profile. This cloned image profile will be the target for our software package update. You can check the success again with Get-EsxImageProfile. At this point you should get two image profiles listed. New-EsxImageProfile -CloneProfile HP-ESXi-5.5.0-Update2-5.76.36 -Name HP-ESXi-5.5.0-Update2-5.76.36-AMS-updated -AcceptanceLevel PartnerSupported -Vendor "Hewlett-Packard"
Now you can update the HP AMS package. The update is done using the Add-EsxSoftwarePackage commandlet. When you compare the original and the clones profile, you should get this result. Note the UpgradeFromRef entry. The last step is to export the clones and updates image profile to a ZIP or, this is our case, to a ISO file. This ISO file can be used to upgrade hosts using VMware Update Manager. That’s it. Now you can update you hosts with this ISO and you have automatically updates the HP Agentless Management Services. Ivo Beerens wrote a nice script to check the installed version of the HP AMS version. Checkout his blog post about this topic. I discovered today that HP has published a new version of their customized HP ESXi release (vSphere 5.5 U2 Nov 2014). This release includes the latest version of the HP Agentless Management Service Offline Bundle for VMware vSphere 5.5. This entry was posted in Virtualization and tagged esxi, hp, patch, power cli, vExpert, vmware on November 13, 2014 by Patrick Terlisten. Virtualization is an awesome technology. Last weeks I visited a customer and we took a walk through their data centers. While standing in one of their data centers I thought: Imagine that all server, that they are currently run as VMs, would be physical?. I’m still impressed about the influence of virtualization. The idea is so simple You share the resources of the physical hardware between multiple virtual instances. I/O, network bandwidth, CPU cycles and memory. After nearly 10 years of experience with server virtualization I can tell that especially the memory resources is one of the weak points. When a customer experiences performance problems, they were mostly caused by a lack of storage I/O or memory. Some hypervisors have the ability to oversubscribe or dynamically adjust the amount of memory available to a specific guest machine based on the perceived usage of memory in the guest machine as compared to the needs of other guest machines managed by the same hypervisor. This technology makes sense for workloads in which memory is needed for brief periods of time and then can be surrendered for other uses. However, it doesn’t make sense for workloads that are designed to use memory on an ongoing basis. Exchange, like many server applications with optimizations for performance that involve caching of data in memory, is susceptible to poor system performance and an unacceptable client experience if it doesn’t have full control over the memory allocated to the physical or virtual machine on which it’s running. As a result, using dynamic memory features for Exchange isn’t supported. There are similar statement for Exchange 2007 and 2010. At the first moment I thought “Okay, looks like the Exchange-on-NFS thing”. Check Josh Odgers blog post if you want to know more about this Exchange-on-NFS thing. If you’re running your Exchange on NFS, don’t read it. There is reason to believe that you will go out and shoot a Microsoft engineer after reading it. After a couple of seconds I thought “What does dynamic memory feature mean?” This was the beginning of a journey into the deep of hypervisor memory management. Memory is the only component in a server that can’t be oversubscribed. That’s plausible, because you can schedule multiple VMs to a single CPU core using a time-slice mechanism. But you can’t share a memory cell, if a VM has stored data in it. Now you have a number of options. You can configue a static memory size for each VM. If you have 32 GB memory in your virtualization host, you can run e.g. two VMs with 8 GB and four VMs with 4 GB memory. But what if a VM needs more memory? Either you reduce the amount of memory for the other VMs or you have to add memory to your host. Not very flexible. Now suppose that the VMs take full advantage of its configured memory only very rarely. In this case we can use the unused memory for the running or new VMs. We can oversubscribe the memory of the physical host. But this only works as long as the number of actively used memory is less or equal the memory size of the host. We have to react only in the case that a VM wants to take full advantage of its configured memory. How does VMware ESXi manages its memory? Since the introduction of large pages (2 MB memory pages), TPS is only used under memory contention (thanks to Manfred for this hint). With TPS the memory is divided into pages and the hypervisor checks, if some of the pages are identical. If this is the case, the hypervisor stores only one copy of page and sets pointers to the identical ones. If you’re running a lot of similar VMs, then TPS can reduce the amount of used memory. Ballooning uses a special driver inside the VM. The hypervisor can use this driver to allocate memory inside of a VM. The OS inside the VM then frees up memory that isn’t used. The hypervisor then can reclaim that memory. Memory compression is used shortly before the hypervisor has to swap to disk. If a memory page can be compressed by at least 50% it’s held in the memory compression cache (10% of the memory is reserved for this). Otherwise it’s swapped to disk. Swapping is the last technology. If there is no more memory left and the other technologies are used up to their maximum, memory pages are swapped out to disk. Please note, that this is a very rough summary. For more information, please check VMware vSphere Resource Management Guide. With this techniques you can easily create four VMs with each 16 GB memory on a host with 32 GB memory. 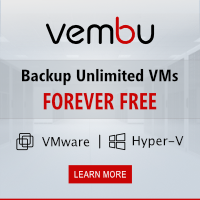 Important is, that the VMs can only allocate less then 32 GB memory, because the hypervisor also needs some memory for itself and virtualization overhead. A VM needs at least the amount of overhead memory to start on a VMware ESXi. How does Microsoft Hyper-V manages its memory? Until Windows Server 2008 R2 SP1 Microsoft Hyper-V was unable to do dynamic memory management. Only static memory allocation was possible. To stay with the example, it wasn’t possible to start four 16 GB VMs on a 32 GB host with Hyper-V. During the power-on, Hyper-V reserves the configured memory of the VM, which makes unused memory unavailable for other VMs. With Windows Server 2008 R2 SP1 Microsoft added dynamic memory management to Hyper-V. Since then you can enable dynamic memory on VM-level. After anabling it for a VM you can set a so called “Startup RAM”. This is the amount of memory which is assigned to the VM during startup. This is because Windows needs more memory during startup than the steady state (Source). It should be set to the amount of memory which is needed to run the server and application with the desired performance. You can also configure a “Minimum RAM”. This is the amount of memory up to which the hypervisor can reclaim memory using a ballooning technique. Because you can configure a “Minimum RAM”, you can also configure a “Maximum RAM”. This is the amount of memory up to which the hypervisor can add memory to the VM. And now comes the interesting part. Any idea how the hypervisor adds memory to the VM? No? He’s using memory hot-add! If the VMs needs more memory, it’s simply hot-added to the VM. This explains why the OS inside the VM has to support memory hot-add in the case you want to use dynamic memory. And it explains also why some applications are not supported with Hyper-V dynamic memory. IMHO it’s not the dynamic memory managemet itself, which leads to Microsofts support statement. It’s the way how Microsoft Hyper-V manages the dynamic memory. Exchange checks the configured memory during the start of its services. If the memory size is increased after the start of the services, Exchange simply doesn’t recognizes it. On the other hand Microsoft SQL Server can profit from hot-added memory. Because of this, dynamic memory is supported with Microsoft SQL Server (check question 7 and answer 7 in the linked KB article). VMware ESXi doesn’t hot-add memory to a VM. Therefore you have to configure a suitable memory size. If you hot-add memory, then the same restrictions apply as for Hyper-V. Instead of relying on memory hot-add you can configure the suitable memory size when using VMware ESXi. But always remember: Memory oversubscription can lead to performance problems, if the VMs try to allocate the configured memory! Best practice is not to oversubscribe memory. Memory management in ESXi and Hyper-V strongly differs. There’s no better or worse. They are too different to compare and they are developed for different use cases. This entry was posted in Virtualization and tagged esxi, hyper-v, microsoft, vExpert, virtualization, vmware on August 3, 2014 by Patrick Terlisten. @vMario156 Yes, this was stated in an older version of the best practice guide. 1 IO is currently best practice, not only for 3PAR. Later Craig Kilborn joined the conversation and I decided to clarify this 100 or 1 IOPS myth the next morning. @Craig_Kilborn @vMario156 I check this tomorrow at the office. I don't know why this was changed, but it has changed from 100 to 1 IO. 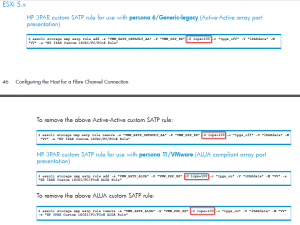 In order to give you some context: I wrote a blog post about adding a custom SATP claimrule for HP 3PAR StoreServ storage on ESXi. In this blog post I pointed out, that the claim rule is usually used to change the default behaviour for switching the path for active IO. For the VMW_PSP_RR this is 1000 IOPS, which means, that after 1000 IOPS for a specific device, the path for the active IO to this device ist changed to the next active and optimized IO path. I recommend to read this blog post from Duncan Epping for more information. The implementation guide provides you the necessary information for the implementation. The best practice whitepaper will cater to its name: it is a best practice whitepaper. So the first one shows you how to do the right things, the second document shows you how to do things right. Lets have a look into the implementation guide on page 46. There are several commands to add a custom claimrule, depending on the selected host persona. As part of PSP Round-Robin configuration, the value of IOPS can be specified. IOPS is the number of IO operations scheduled for each path during path changes within the Round-Robin path selection scheme. The default IOPS value is 1000. HP recommends IOPS=100 as an initial value and starting point for further optimization of IO throughput with PSP Round-Robin. With the exception of ESX/ESXi 4.0 versions, it is preferable to set the IOPS value within a SATP custom rule. Okay. Lets take a look into the best practice guide. On page 8 HP describes how to add a custom claimrule. This time with IOPS=1. Managing a Round Robin I/O path policy scheme through the vSphere Web Client on a per datastore basis does not allow setting important Round Robin policy details that can be specified when using the command line on the ESXi host. To achieve better load balancing across paths, the –iops option may be issued on the command line to specify that the path should be switched after performing the specified number of I/Os on the current path. By default, the –iops option is set to 1000. The recommended setting for HP 3PAR Storage is 1, and this setting may be changed as needed to suit the demands of various workloads. In a version of March 2013 of the HP 3PAR StoreServ Storage and VMware vSphere 5 best practices guide, this statement isn’t included! I assume that this happened due to the release of 3PAR OS 3.1.2, which was announced in December 2012. With 3PAR OS 3.1.2 the host persona 11 was released and it was recommended to use this with VMware ESXi. 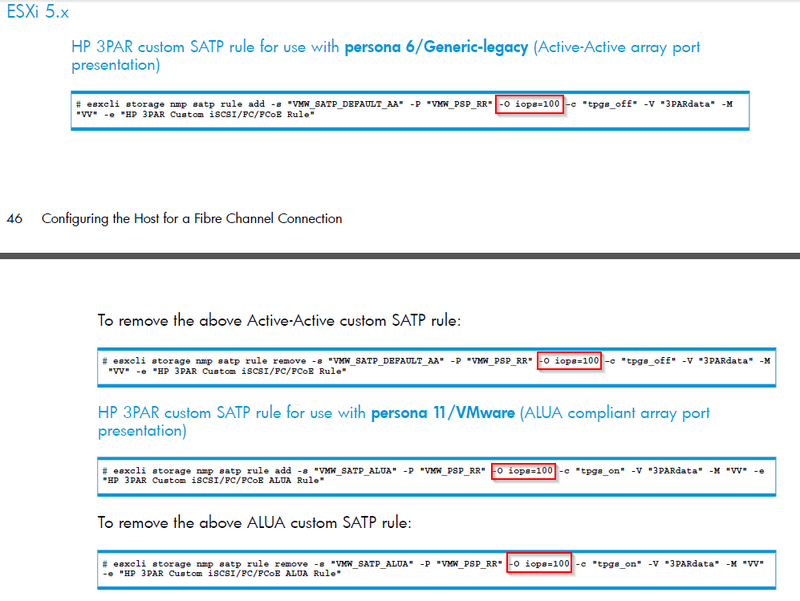 With host persona 11 the hosts use VMW_SATP_ALUA instead of VMW_SATP_DEFAULT_AA. Depending on the document and the age of the document, different IOPS values are stated. IOPS=100 is stated in the implementation guide and should be used as a start value for further optimizations. The best practice guide clearly recommended IOPS=1. I recommend to do some tests with your customers workload and then choose whether 100 or 1 IOPS. 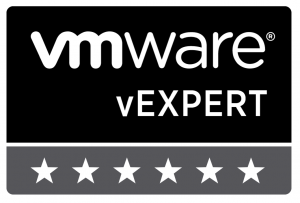 This entry was posted in Virtualization and tagged 3par, esxi, hp, storage, vmware on June 6, 2014 by Patrick Terlisten.